Always a time of transition, March this year is particularly poignant for Japan. This Sunday marks the one year anniversary of the earthquake that shook the country to its core. The last year saw calls for conservation, high levels of concern regarding radiation contamination, the search for alternative energy, and continuous efforts to help our northern neighbors as they strive to rebuild their lives safely and sustainably. Shopping at a farmer's market may seem trite, but it supports growers and producers, especially those from Tohoku, that rebuilds businesses, economies, and confidence. These markets aren't just about vegetables or grains or miso or handwoven hats. Rather, they are about building community, showing a neighbor you believe enough in what they do to exchange hard-earned money for a freshly picked daikon, a beautiful bunch of komatsuna, or an interesting flavor of jam. The earthquake may be one year behind us, but our need for each other is ever present. 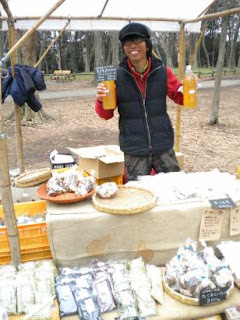 Today's Photo: Shingo-san of Makinonouen takes a moment to pose for the camera at the Kichijoji Earth Day Market while customers circled the table eyeing the great selection of heirloom soybeans, homemade pickles, and more.